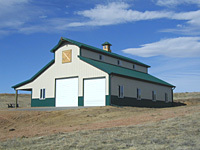 Monitor Barn (aka Raised Roof Barn) is the barn that has the center portion of its roof raised (or pushed up) from the main roof, which is then is supported by the addition of knee walls (short walls). It is interesting to note that the look of this barn can slightly be altered simply by pushing the center part of the roof higher or by making the center part either narrower or wider. Monitor Barn has a very unique look and is preferred by some people over the regular Gabled Roof Barn just for its look. We can't really give an advise on which style of barn to use. It is really up to you and your preferences. Not everyone might like the look of a Monitor Barn and the fact that the loft space is limited to over the center aisle only. On the other hand, if you are not planning to put the loft in, you can have more headroom in the center of the barn and more day light coming in through the side windows. In fact, having side windows installed on the top instead of on the first floor (as shown on this picture) will actually provide better security (just a thought). Copyright © 2010 - 2019 BarnToolBox.com All rights reserved.